Magno-Humphries Laboratories, Inc., voluntarily recalled one lot of Senna Laxative tablets, 8.6mg Sennosides, after it was discovered that bottles labeled as Senna Laxatives actually contained Naproxen Sodium 220mg, a pain reliever and nonsteroidal anti-inflammatory drug (NSAID). Unintentional consumption of naproxen could result in fatal adverse events in patients with underlying illnesses, allergies, or cardiac, gastrointestinal, hepatic, and renal conditions, as well as patients who have recently undergone cardiac bypass graft surgery. Patients may inadvertently overdose by taking another NSAID concurrently, thus increasing the risk for NSAID associated adverse events, including myocardial infarction, stroke, congestive heart failure, renal toxicity, bleeding, ulceration, or perforation of the stomach or the intestines. NSAIDs are commonly used in workers' compensation to help manage pain, as are laxatives to treat opioid-induced constipation. For further information, read the FDA's safety alert. In late December, PharMEDium Services LLC issued a recall of several compounded products due to a lack of sterility assurance. That recall notice was then expanded to include even more drug products. A retrospective review of all commercially distributed product lots compounded in a Memphis location indicated that a total of 55 lots of different products impacting 25,327 units had two unsuccessful media fills, which test whether the aseptic procedures of manufacturing are adequate to prevent contamination during production. 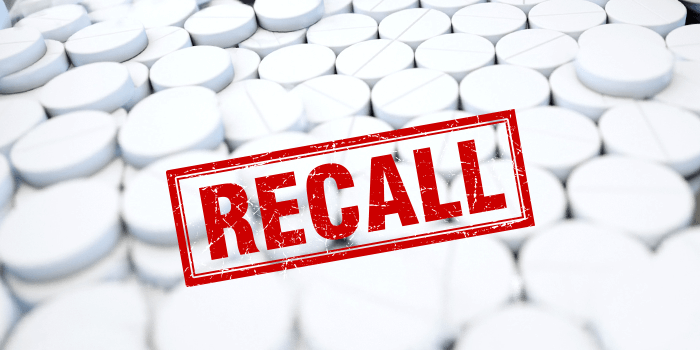 Specific to workers' compensation, the original recall included several compounded opioid products, including various lots of fentanyl, morphine, and hydromorphone compounds, along with certain lots of benzodiazepine compounds that included midazolam. The expanded recall now includes all lots within expiry from PharMEDium's Memphis, Tennessee facility. Those in possession of any of the affected medications that are being recalled should immediately quarantine the product, discontinue use and destroy them. Administration of a drug product intended to be sterile that is not sterile could result in serious infections that may be life-threatening. For further information, see the expanded FDA recall notice. 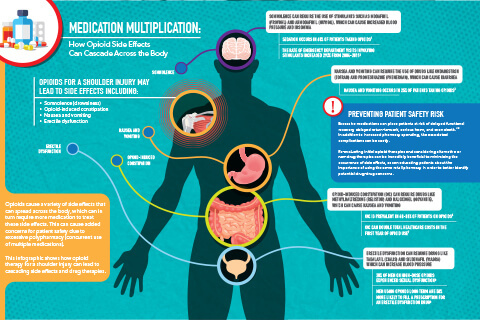 Opioids can cause a variety of side effects that can spread across the body, which in turn require more medication to treat these side effects. This can cause added concerns for patient safety due to excessive polypharmacy (concurrent use of multiple medications). 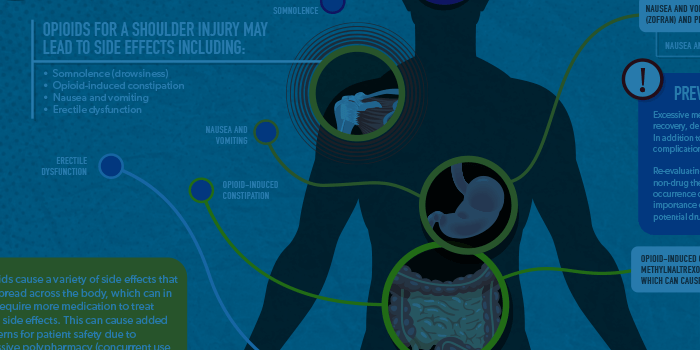 This infographic demonstrates how opioid therapy for a shoulder injury can lead to cascading side effects and drug therapies. 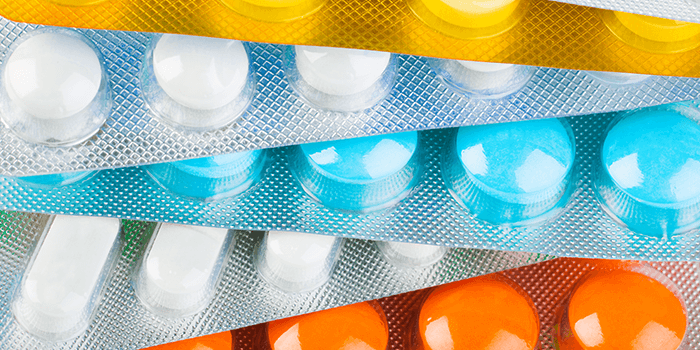 The FDA is currently working with manufacturers of loperamide, an over-the-counter anti-diarrhea drug, to use blister packs or other single dosage packaging to limit the number of doses in a package. This comes after reports of serious heart problems and deaths from much higher than recommended doses of loperamide. 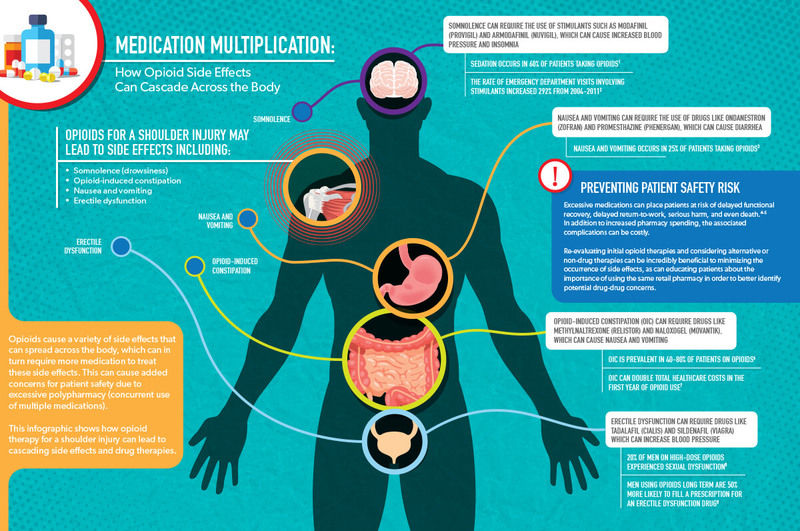 These adverse events are due to loperamide's increased use as a drug of abuse, particularly among those addicted to opioids, as high doses of loperamide can mimic the euphoric effects of opioids, and many individuals are using loperamide to treat symptoms of opioid withdrawal. A study from Pharmacotherapy: The Journal of Human Pharmacology and Drug Therapy reviewed data from a poison control system's electronic database, finding that from 2002 to 2013, there was an average of 12-19 incidents a year involving anti-diarrhea drug toxicity, yet that number spiked up to 41 incidents in 2014. Furthermore, the Journal of American Pharmacists Association conducted a literature search through PubMed for loperamide and other key words, finding that between 1985 through 2013, only 21 cases of loperamide toxicity were uncovered, yet 33 cases occurred between 2014 and 2016 alone. The New York Times covered the use of loperamide as "a poor man's methadone" in 2016, explaining that the drug was tied to several deaths and the presence of irregular heartbeats in at least a dozen cases across five states over a period of 18 months. In one case, an overdose victim had 25 times the recommended dose in his system. Loperamide abuse often goes undetected because drug screenings do not regularly test for it, leading some to speculate that this issue may be underreported. A warning was added to loperamide product labels in 2017 to warn against ingesting high doses, but the warning has not had the desired effect. Following a unanimous passage from the House and Senate, Arizona Governor Doug Ducey recently signed the Arizona Opioid Epidemic Act, which limits initial opioid prescriptions to five days for all opioid naïve patients, while also limiting the dosage to levels defined in federal prescribing guidelines. The bill also expands access to naloxone, enacts Good Samaritan laws for opioid overdoses, enhances continuing medical education for opioid prescribers, and requires pharmacists to check prescription drug monitoring programs (PDMPs) prior to dispensing opioids. This sweeping resolution is a multi-pronged approach to curbing the opioid epidemic, and is just one of many recent state-driven initiatives across the country. Tennessee Governor Bill Haslam announced a comprehensive plan that established five-day, 40 MME (morphine milligram equivalent) limits for initial opioid prescriptions, while also establishing a special opioid commission and investing $25 million for treatment and recovery services for opioid dependent individuals. Meanwhile, North Carolina proposed new opioid prescribing guidelines to limit opioid use to 12 weeks or less for acute pain, with five-day, 50 MME dosing limits for initial prescriptions, and Pennsylvania declared the heroin and opioid epidemic a statewide disaster, implementing 13 key initiatives, including expansion of the state PDMP, increasing access to naloxone, and improving access to medication-assisted therapy. 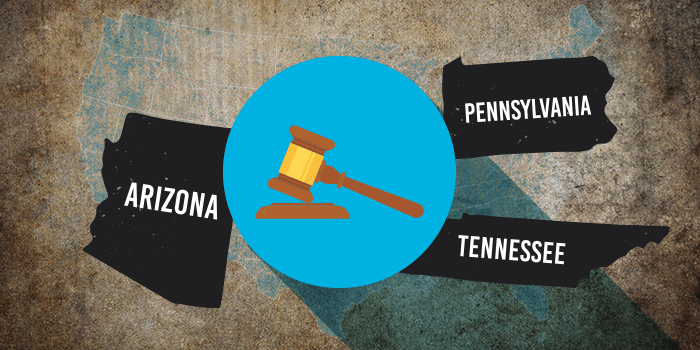 Healthesystems has previously explored how state and federal legislatures have attempted to bridge the gap between opioid policy and prescribing, but it appears that states are now leading that charge more than ever, as 2018 has already seen a plethora of opioid laws enacted. Earlier this year, Michigan passed opioid prescription limits, Nevada implemented prescription limits passed last year, South Carolina created an Opioid Emergency Response Team and plans to create an opioid prescribing policy, and California recently held a hearing to discuss ways to use their PDMP to better track opioid prescriptions. With so much momentum behind state-driven opioid legislation, it is likely that more laws will continue to pass in upcoming years. Since January 1st, there have been over 113 new pieces of legislation introduced which address opioids, and of those 43 would directly impact workers' compensation if passed into law. The collective efforts of these initiatives, if passed, will undoubtedly play a role in lessening the impact of this devastating epidemic. In 2005, the Bureau of Labor Statistics (BLS) estimated that 2-4% of the workforce was part of the gig economy, a labor force that, with no exact definition, is frequently characterized by an environment of short-term jobs or temporary contracts. However, the BLS estimates that between 2003 and 2013, at least one million employees joined the gig economy, and the National Bureau of Economic Research found that in 2015, 15.8% of American workers were employed within the gig economy. The Government Accountability Office estimated that, depending on the definition of gig work, as many as 40% of American workers are part of the gig economy. Gig work can include traditional labor such as construction, painting and carpentry, along with transportation jobs and ridesharing services, and even positions at temp agencies and contract-based IT services. While positions vary greatly, a common feature of gig employment is that, due to the temporary nature, employees are often classified as independent contractors, depriving them of employee benefits, including workers' compensation. In fact, in the case of Lawson v Grubhub Inc., a U.S. District Court ruled that independent drivers were not company employees, and were not entitled to legal rights of employment such as minimum wage or workers' compensation. But as the gig economy continues to grow, employees' demands for benefits has grown as well, and will likely trigger industry and legislative action in the near future. This changing landscape, partially attributed to the recession, may require a new approach to workers' compensation as traditional practices were not designed for work of this nature. For example, many have argued that portable benefits should follow employees, allowing various employers to pay partial premiums. 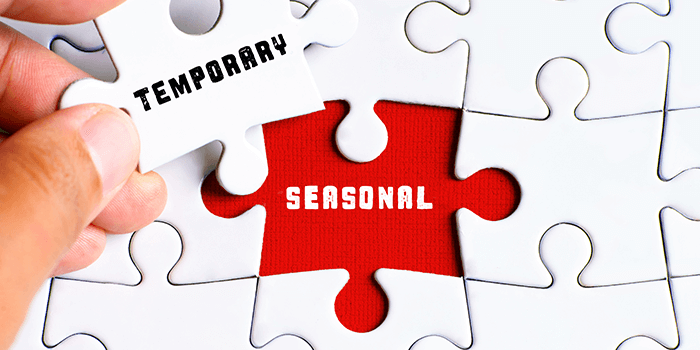 In Wisconsin, a Third District Court of Appeals recently declared that temporary workers have the right to either file suit against their employers or claim workers' compensation benefits if they are injured on the job. Meanwhile, the City of Seattle gave taxi and ride-sharing drivers the ability to unionize and negotiate their benefits with employers. Going a step further, Washington State recently introduced House Bill 2812, which aims to provide workers in the gig economy access to workers' compensation and other benefits, while New York City, home to 1.5 million freelance workers, created a portable benefits taskforce to study creative options to help contract workers gain access to benefits. New York officials are even hopeful that such programs can be modeled after the Black Car Fund, which adds a surcharge to all cab rides in order to fund health insurance, workers' compensation, and other benefits for cab drivers. However, there are few if any solid models for what workers' compensation would look like in the face of the gig economy. Unanswered questions include who would manage care, how benefits would be brokered, what practices would be best for different industries, and how spending can best be managed. Regardless of the actions taken to assist the millions of gig employees, this trend will not only eventually add more patients into the workers' compensation system, but it will likely introduce new types of claims and claim questions that will require significant research to understand. It is simply a matter of time as the data continues to show how big the gig economy has become. In 2016, Intuit, the owners of Turbo Tax, estimated that 34% of working Americans worked on-demand gig jobs, and they expect that number to hit 43% by 2020, while a poll conducted by NPR and The Marist Poll found that one in five jobs is for contract work, with estimates that contract work will make up half the workforce in a decade. In 2017, the BLS finished collecting new data on the gig economy, and while no word yet has been announced if and when that data will be assembled into a report, it is very likely that more data will highlight the significance of this growing trend.